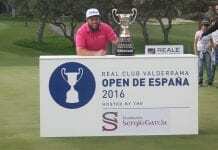 OPEN de Espana winner Andrew Johnston revealed he burst into tears after winning his maiden European Tour title at Real Club de Valderrama. The Englishman held off challenges from Joost Luiten and host Sergio Garcia to seal a famous one-shot win from the Dutchman, with the Spaniard finishing third. Johnston, 27, claimed victory when Luiten was unable to birdie either of the final two holes to give him his first win in his 63rd European Tour start. “I came off the course and I just started crying with the emotion of it,” said Johnston. “It’s what you dream of. You see the history of the event and you see all these names [on the trophy], and you put mine on there and it seems pretty ridiculous. Johnston admitted he didn’t think he would last beyond day one, given the demanding rigours of Valderrama. His 1-over 285 total is the first over-par title wining score on the European Tour since the 2013 U.S. Open at Merion. 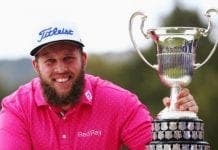 And the man known as Beef, who earned his European Tour card through the Challenge Tour, admitted he was astonished his first title had come so soon. “The greens here are so tricky and so quick,” said Johnston. “I honestly thought I was going to go out on Thursday. But I picked up on the range on Wednesday afternoon and I played lovely on Thursday. “I struggled on the first year of the European Tour. You’re playing with all the top players you see on the telly all the time. All in all, I think it put me in a good position.